Ptolemy 1 Meryamun Setepenre (c.a. 367-283 B.C.E- Before Common Era) (aka Soter) (“Soter” means savior) became the first European pharaoh of Egypt through military force led by Alexander the Greek (a.k.a Alexander the Great). When Ptolemy became pharaoh of Egypt, he wanted the Egyptians to consecrate him as a god. He wanted to be called a god because that was the title all of the pharaohs of Egypt were called prior to him. However, the people of Egypt refused to call him a god because they knew the only reason he became a pharaoh was through force, so in “305 BC -Ptolemy took the title of Pharaoh, taking the Egyptian name Meryamun Setepenre, which means “Beloved of Amun (Amun means God) Chosen of Ra(Ra means God)”, and because of the Egyptians refusal to acknowledge him as a God, he began killing the people of Egypt, which caused the Egyptian priests at Memphis to give into his request by agreeing to consecrate him to priesthood, in order to save their own lives. The key words in the above passage to keep in mind during your reading: Meryamun, Setepenre, Soter, which are words that were used to create the fictitious character of JESUS CHRIST in AD by Roman Emperor Constantine (Meryamun, Setepenre, Soter were used in B.C). The images of Ptolemy below, which are similar to the images that are depicted as “Jesus” today, were forced upon the Africans and were ordered to be worshipped by the people of Rome. Let us continue to A.D.
Serapis Christus Greco Roman c.a 135 B.C.E. The marble image in the London museum is the image they use of Christ (Jesus) today. 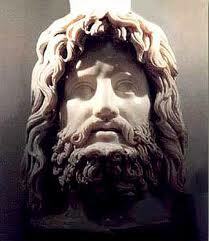 Christus was also the nickname for Serapis. Ptolemy’s rule was to create a deity that would be worshipped by both the Egyptians and the Greeks. He created “Serapis “, the made up Graeco-Egyptian god that was invented in the 3rd century B.C., portrayed as Greek in appearance, but with Egyptian accessories, representing both wealth and resurrection. Constantine the Greek (a.k.a Constantine the Great) Roman Emperor from 306 to 337, is known for being the first Roman emperor to be converted to Christianity which strangely enough, Arius of Libya (256-356 AD) born of African descent centuries after Ptolemy 1, had a problem with the Roman empire teaching the Africans and the people of Rome to worship a statue and celebrating death. He was considered a heretic, a professed believer (of God), who maintains religious opinions contrary to those accepted by his or her church (what the religious authorities usually controlled by government deem as the truth). Because he started attracting so many followers due to his teachings that were contrary to the Romans, Constantine called the council by summoning all the bishops to discredit Arius, The Council of Nicaea. During the time when this meeting was called upon, there was no mention of Jesus Christ at all; no man had ever existed by the name JESUS Christ, and an important fact is that this all took place Anno Domino (AD) (which Christians claim means after the death of Christ) but in Latin means ‘in the year of the lord’. The name Jesus Christ didn’t exist before the meeting was called (read the statements made during that timeframe). It was only after this that they presented to the people the name JESUS CHRIST. What Lord are they referring to? Kings have always been referred to as Lords or gods. If Jesus Christ didn’t exist during the time this meeting took place nor ever heard of whom are people worshipping today? 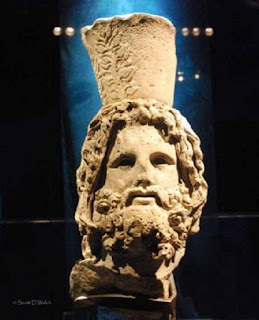 Serapis Christus? Nicean creed which became the statement of the Christian faith was written decreed and sanctified by 318 Roman Catholic bishops at the council in 325 AD (some believe this transformation took place “Council of Chalcedon” 451AD). The authorities shut Arius down and threatened him with death to keep his mouth shut. They positioned the creed during the time when people started becoming aware of the lies and deception, and ordered all books to be burned; destroying all ancient writings, “no evidence no argument”, and the outcome was the transformation from Serapis Christus, which means Christ the Savior, to Jesus Christ by edict of Emperor Constantine in 325 AD. Christians, do your research. There may have been a man that walked the earth in the land known as Nazareth that attempted to guide the people back to righteousness, but, this man was not JESUS CHRIST. You see no mention of any man in Nazareth named JESUS mentioned during the meetings in Rome, or of a woman named Mary (the virgin) giving birth to a child named Jesus. This would explain why there is so much emphasis put on JESUS CHRIST in the bible, which further explains why God all of a sudden had to have a “son” (sun of God was turned to the son of God by Europeans, which is why every picture of Jesus has the sun behind his head. (Sun Ra, Sun of Ra (God)). 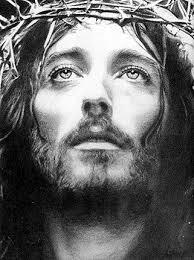 The man you acknowledge as Jesus Christ of Nazareth was born in 4 BC; all of the above took place before that date. Not only Christianity were based on mythology, but other religions too without exception.